PARDES Restaurant, located at 497 Altantic Avenue in downtown Brooklyn is one of the hottest Kosher meat restaurants in the New York area today. It is a casual restaurant with impeccable service and delicious food. The food pairings are most interesting and that is why I enjoyed it so much. I’d been there before with some friends and decided to go with my husband for our recent anniversary. The only downside is that the restaurant is small, having between 30 and 34 seats with not much room between tables. In fact, the couple next to us, who were members of a party of 6, were asking what we were eating and continued to make conversation with us. It’s not often that my hubby and I go out for a formal dinner, and I’d hoped it would be a bit more intimate. For our first course, we ordered Deviled Ribs, with shaved fennel Slaw and Chicken n’ Porcini Waffles with apple confit and chestnut cream. Both were good but the ribs won first place! While the waffles themselves weren’t awesome (maybe because I prefer them covered in soft chocolate ice cream and chocolate sauce! ), the little fried chicken nuggets it came with were great paired with the chestnut cream and apple. It was a nice combination of flavors and presented nicely. For the Entree, my husband, uncharactaristically ordered (Sara’s Spring) Chicken and loved every bit of it! 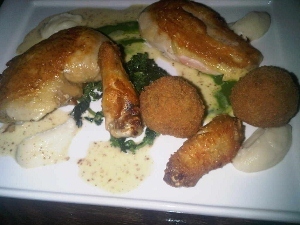 His dish came with a grilled boneless chicken breast, a grilled bone-in chicken thigh, and 2 separated parts of a wing. It was served with 2 round fritters of quinoa and pureed cooked kholrabi. I had the Black Angus Steak grilled to perfection to medium doneness, as per my request. 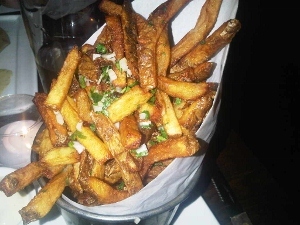 It came with their signature French Fries tossed with fresh parsley and served with truffle mayo (yum) and house made ketchup (wasn’t into). 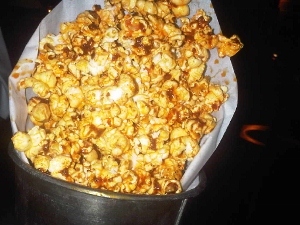 While we were waiting for the main dish to arrive, we couldn’t help but notice other tables being served an enticing portion of Pardes’ Smoked Paprika Popcorn, and ordered a portion. These we were not so fond of as the flavoring gave it a wet, soggy quality which we did not enjoy. 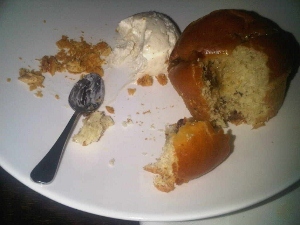 Dessert was Bourbon Baba for Naftali and Chocolate Mousse for me. The Baba is a yeast based pastry, soaked in bourbon and totally not our speed. Yeast cakes are best served fresh and this had a stale quality. 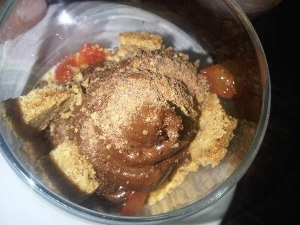 It was served with Popcorn Ice Cream and Smoked Peanut Brittle, both good. The Mousse was served in a leaning glass, with whiskey/cardamom Creme Anglaise, Blood Orange, which lent the dish a balancing tartness, Rye Cookies, and Cocoa Nib (for crunch). I thoroghly enjoyed the combined flavors of this dessert. Pardes’ menu is seasonal and I probably should have been a bit more daring in my menu choices – but while I enjoyed our meal very much, I think my husband prefers a restaurant that is more “on the beaten track” with “regular” fare. The next time I go to Pardes, it’ll probably be with a group of friends! I recommend Pardes, and advise you to make a reservation well in advance of your visit. Also, consider an early reservation for the best service. A class at the Institute of Culinary Education in NYC last night was a great opportunity for my friend Sarah Lasry-Leizerowski (www.kosherstreet.com) and me to try out the newest Kosher restaurant in Tribeca, SUSHEIN. 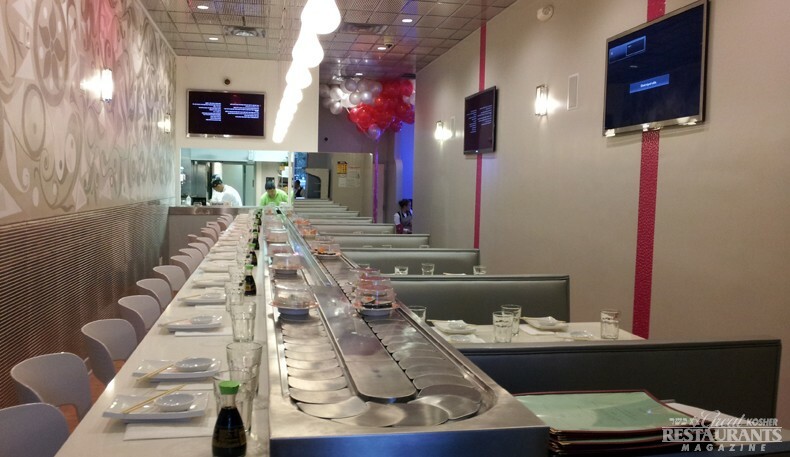 Under the supervision of the OU, Sushein is also the first Kosher restaurant to deliver sushi to the tables via conveyor belt. The decor is modern and fun and centers around a conveyor belt straight down the center of the store. 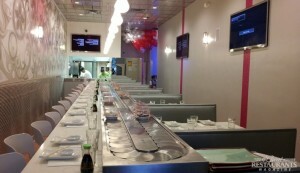 Both the 18 bar seats, and 5 booths can easily access the diverse selection of sushi on the conveyor. It is possible to have a complete sushi meal here, from appetizer to dessert, as sushi is presented in fish, beef and even dessert versions. There is also seating for private parties which cannot access the conveyor. 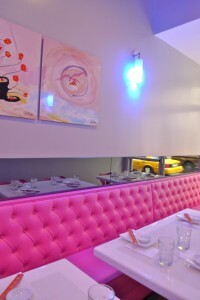 Regardless of where you are seated, food can be ordered from their Asian inspired menu. Sarah and I arrived at about 5:00pm and the store was fairly quiet at that time. We chose to be seated in a booth and were happy that the tables were on a platform, to enable us to enjoy the options on the conveyor belt. Since we knew that we would want to try several varieties of sushi, we chose to order and share 1 portion of soup, appetizer, main dish and dessert from the menu. While we waited for our dinner to arrive, we sampled a salmon, avocado, tuna roll off the conveyor. A little color coded sign, sitting on the table, tells you how much the sushi is, based on the color of the melamine plates holding the sushi. Note that the plates are small and typically hold 3 or 4 pieces of sushi. 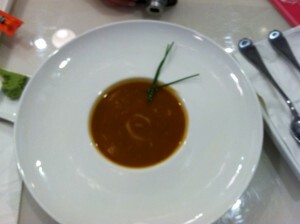 When the Sweet Potato Coconut Curry Soup ($6) arrived, we admired the beautifully presented dish in a bowl resembling an upside down hat. Although the flavor combination had potential, the soup was a bit too sweet and had a very intense flavor (like that of over caramelized sweet potato). Next we sampled the Spicy Tuna with Crispy Wonton Chips appetizer for $14. 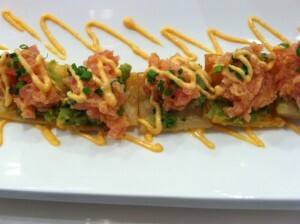 The wonton chips were squares of fried egg roll skins and they were topped with guacamole and spicy tuna. A bit of spicy mayo topped each of the 8 pieces and was also used to decorate the plates. The presentation was nice and the taste likewise. We asked for some sweet sauce and spicy mayo on the side and were told that there would be an additional $1 charge for those. Now that we were done with our fish dishes, we were ready to try the meat sushi. This sushi was esthetically appealing, as well as delicious. 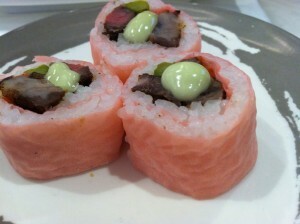 The pink rice paper wrapped around the sushi brought out the pink of the meat and we enjoyed our first taste of meat sushi. Our main dish of Caramelized Short Ribs was exquisitely delicious. Served in a bowl with high sides, the ribs were perfectly done, soft enough to fall off the bone but not quite falling off the bone. They were sitting atop Thai barbecue rice noodles and a saute of mushrooms and wilted greens, including endive, bokchoy,and spinach. At a fair $26, Sarah loved the short ribs, but found the rice noodles a bit too spicy. 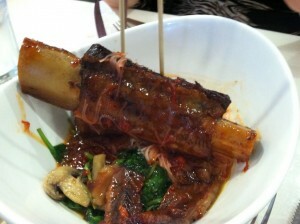 The ribs seemed to have the same flavor and coating as the rice noodles. At this point the owner, Sheindy Kletzkin stopped by our table to see if everything was OK. We learned that she and her husband have recently moved to the US from Israel and have created this restaurant inspired by European models of Keiten-zushi (conveyor belt sushi). In fact the name Sushein was meant to incorporate Sheindy’s name. Although I typically don’t order fish for dinner in a restaurant, Sheindy said that their fish is superb. While Sushein is, of course, Kosher, they are hoping to attract a non-Jewish clientele as well. Considering, how good the food and service are, this should not be difficult! Although Sarah thought the portions were on the small side, we’d been sharing, and I felt the portion sizes were fair, as we were quite satisfied by then. But what is dinner without dessert? We decided to try the Coconut Creme Brulee as an end to our meal. 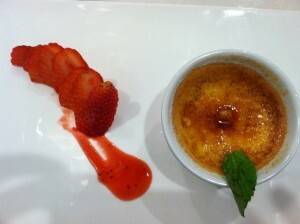 All the desserts are priced at $9 and the Coconut Creme Brulee was an excellent choice. 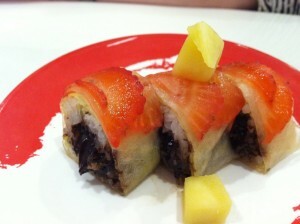 Of course, we also tried a dessert sushi. This one consisted of a chocolate center, surrounded by rice and clear rice paper, topped with thinly sliced strawberries. We felt the rice was out of place in this sushi, and besides, I don’t love strawberries and chocolate. But it did look pretty and exciting. The meal for the two of us totaled $88 and change. On the whole, we would definitely go back to Sushein. Not necessarily for the conveyor belt or the sushi, but rather, for those short ribs which I can hear, are calling our names……. For years, Dunkin’ Donuts reigned supreme as the king of fast-food coffee, towering over a field of lesser brews. Then, one day, Starbucks (SBUX) came along with pricier gourmet options, and the the war was on. Recently, as the two waged their bitter battle to become the country’s caffeine champion, McDonald’s (MCD) entered the fray with McCafé, a brave attempt to muscle in on America’s growing taste for premium coffee. Proclaiming the delicious flavor of its McCafé specialty coffee blend, a brew that “comes from Brazil and the mountains of Sumatra, Guatemala and Costa Rica,” the clown and his cohorts have transformed a coffee field that was once easy to navigate into a desperately complicated mix of flavors and prices. To get a better idea about which coffee is best — and which offers the best bang for the buck — we decided to conduct a semi-scientific survey of the big three: Dunkin’ Donuts, McDonald’s and Starbucks. Posing as normal customers, we picked up a few cups of large coffee at each restaurant and served them to 10 tasters that we randomly chose from The Huffington Post/AOL newsroom. To make things even more interesting, we also tested out our own office coffee. Consider it a sort of control group. 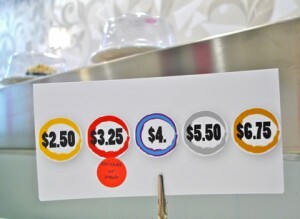 In terms of price per ounce, the three competitors were fairly close: Dunkin’ Donuts, the cheapest, cost $0.103 per ounce, while McDonald’s weighed in at a slightly more expensive $0.105 per ounce. Starbucks was the most expensive, priced slightly more than $0.12 per ounce. 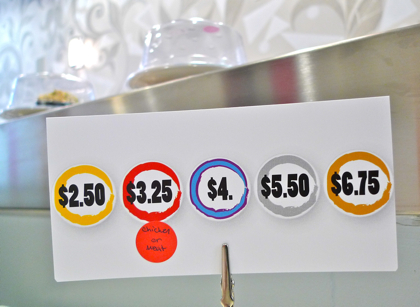 But that extra 2 cents per ounce went a long way. Our tasters described top scorer Starbucks as “Nutty and smooth,” “A solid cup of coffee,” and “Delish!” Some felt that it was slightly weak, but it was far and away the most popular brand, easily eclipsing AOL’s (AOL) house coffee, which took second place. Factoring in both cost and flavor, Starbucks still retained its top position: it scored almost twice as high as Dunkin’ Donuts and easily outpaced McDonald’s. However, for those who are pinching pennies, McCafé appears to be an acceptable option. As for Dunkin’ Donuts, the former leader clearly needs to reconsider its recipe if it wants to stay in the game. Tonight being Rosh Chodesh Adar II, we took some of our children out to Rimon Steakhouse in Lakewood. 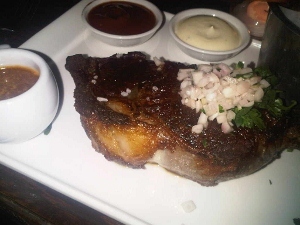 It is generally an American steakhouse with some of the appetizers having a Mediterranean accent. We had reserved a table for 6 and were given a round table which was conducive to nice table conversation. There were sliced Israeli pickles on the table which we munched on hungrily. ﻿﻿My husband and I had arrived before the kids so we took the initiative to order appetizers for the table so they wouldn’t have to wait to eat. We ordered Moroccan cigars with tahini, a portion of sliders (3 mini hamburgers and french fries), a meal on its’ own, BBQ chicken wings, and a beef chummus platter. We washed on warm mini pita rounds and small warm dinner rolls. The appetizers arrived just as our crew got there, and they were happy to dive in. The cigars were good but likely not made in-house ﻿﻿﻿and the tahini was a bit too watery for my liking. The sliders were great! Each one had 2 mini hamburgers on one of their small round dinner rolls smeared with Russian dressing and held together with a toothpick. A half of a slider was more than enough for each of us as we all wanted to sample a bit of everything. The chicken wings were decent but there are two parts to a wing. There’s the mini pulka and “the other” part. Most of us prefer the mini drumstick part since it is easier to eat and more fleshy. This portion only had the “other” part. The beef chummus platter is a winner! This is a large portion of delicious, smooth chummus with tasty, cooked ground beef in the center. You want to get it all when dipping your piece of ripped pita into the chummus, and top it off with pickles for super flavor! Again, chances are the chummus is not made in-house but so long as they know where to buy one of good quality, who cares? Now for the mains: Truthfully, I only tasted my own but the restaurant was very accommodating with regard to switching side dishes and sharing a dish. They happily brought an extra plate and steak knife for the shared portion. I ordered the Entricote Steak Au Poivre, which means black pepper encrusted. 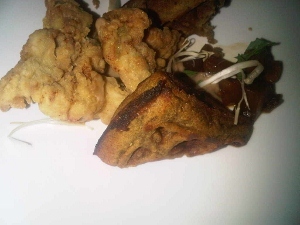 It came covered in freshly fried thin rings of onion, with sides of halved mini red potatoes and grilled vegetables. The dish was plentiful with a mediocre presentation. I ordered the steak medium-rare and it was done to perfection. The potatoes were also cooked to my liking – baked to a crisp on the outside and soft on the inside – yet they were small enough that there wasn’t too much soft potato on the inside. A bit more attention could have been paid to the grilled vegetables. The peppers and onions were on the large side, the zucchini ok. The other 2 portions of steak ordered at the table were a bone-in Rib Steak, and a London Broil. They were equally done to perfection and as ordered , medium-rare. My daughter and SIL ordered salad with grilled chicken strips and grilled dark chicken respectively. They were likewise happy with their choices. There’s more to restaurant dinners than the fare. 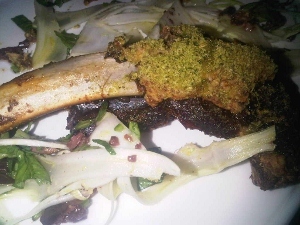 Service, likewise, plays a big part and it is here that Rimon Steakhouse fell a bit short. When we arrived, we were brought glasses with ice cubes, however, the waiter never came around with water or asked us what we’d like to drink. Also the dirty appetizer plates stayed on the table for longer than I would have liked, and in fact were not even removed before the main dish arrived! Suddenly the waiter appeared with our steaks and was scrambling for room to put it down. We ended up rounding up the dirty plates on our own and giving them to him the next time he came by. All in all, our experience was good and I would definitely go back. The entrees range from the low $20’s to the high $30’s and our meal for six cost a little over $200. Although we didn’t have wine or dessert (we were pressed for time! ), we did enjoy 5 appetizers and 5 main dishes. Located on Route 9 and Chestnut Street, Rimon’s ambiance is decent, with a Mediterranean accent. I would recommend this restaurant for a casual dinner and I am confident that you will not be disappointed.